Samson has the right rope for your climbing style. The best in modern rigging rope technology. Fids, pushers, and other tools from the Strongest name in rope. SBright, strong, and with great performance. 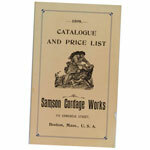 Samson is the oldest, active registered trademark in the United States. Samson Ropes has over 130 years of rope-making experience behind the ropes it manufactures today. A leader in innovation, Samson developed the first synthetic braided climbing line specifically designed for arborists in the 1970s (Arbor-Plex). Samson continues to meet the needs of the professional arborist with the latest innovations and technologies in fiber, coating, construction, and manufacturing techniques. With over 130 years of cordage-manufacturing history behind it, Samson moves into the future with advanced research and development focused on developing and manufacturing the best ropes around. Samson has pioneered many of the tools we take for granted today, such as the first synthetic arborist climb line (Arbor-Plex) and high-strength Dyneema lines for replacing steel cable (AmSteel-Blue.) In addition to advances in fiber and braiding technology, Samson's Samthane coating enhances the durability and snag-resistance of their arborist lines. This video gives an excellent overview of the many ropes Samson makes for various industries, and how they are developed, tested, and built. The Samson rope app is a free download from the iTunes store containing rope inspection checklists, splicing instructions and videos, and a guide for evaluating internal and external abrasion to ropes. Get the Samson Rope App.